"A lot of what inspired me about what happened last year with the elections had nothing to do with Obama being elected. It had to do with the fact that it was obvious that people wanted a change. Unfortunately, people thought they were electing an anti-war president. And, as you see, we're all over it - we got more war going on, and it's not gonna stop unless the people stop it. Unless we scare them into thinking there's a consequence for doing that." 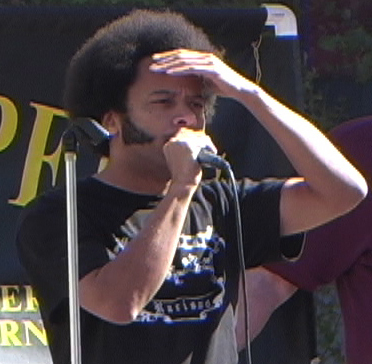 -- Boots Riley, October 17, 2009. Thanks for letting me know at lisa@lisarein.com if anything doesn't work. I'll fix it. 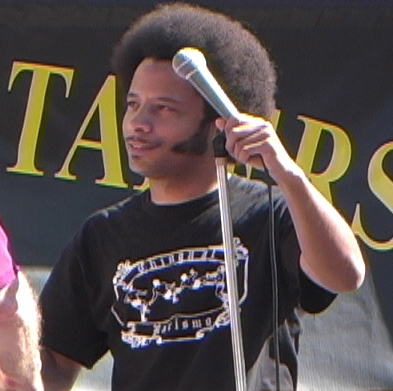 "Just finished performing@an anti-war protest in SF.Very low turn-out.With Obama in, more people r willin2ignore mass murder." 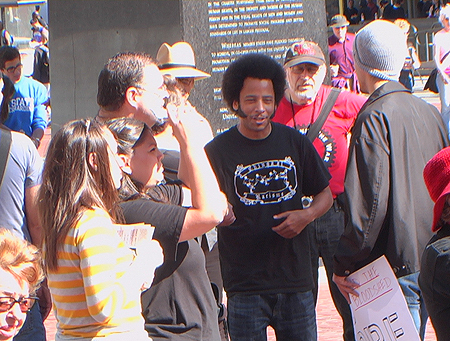 (Above) Boots Riley of the Coup, who's been on tour w/Tom Morello opening for NIN as "Street Sweeper Social Club," is here singing with Trent Reznor doing MC5's kick out the jams. Boots in the crowd after his performance.